Kato crept along the forest path, katana gripped between white-knuckled fingers. A single beam of sunlight pierced the gloom and drew his eye to gears that gleamed amid the flattened grass. The sign he had sought. A piece of the Daimyo of Dust. He held up one hand. The other samurai stopped. The only sound was a single heron, calling out from the nearby river. Kato pointed at the gears, then at more lying beyond them. His comrades gathered around. The Daimyo might not bleed as men did, but this was surely a sign. He was damaged from their last fight, vulnerable, weak. Ukon’s life had been well spent if it gave them victory now. One cautious step at a time, they followed the trail of gears toward a clearing. As they approached, they heard an erratic clatter, the dying noises of a broken machine. At Kato’s signal, the warriors fanned out. Swords drawn, they approached the clearing from every side. If they were quick and careful, they might defeat the mechanical warrior and earn the pardon the emperor had promised, their past failures forgotten. If not, it was more noble to die in battle than on their own blades. The leaves parted to reveal a figure lying in the clearing, his back to Kato. Armoured plates bound together by the elaborate agemaki bow. A broad helmet with crests down its sloped sides. Leg guards and sandals drawn in close. All made of metal, unlike the leather and lacquer Kato wore. All edged with the rust from which the Daimyo drew his name. The rattling of gears emerged from inside that armour. At Kato’s signal, the warband advanced, blades drawn. The Daimyo might be damaged, but he could still be a deadly opponent. They moved like coiled springs, ready to burst into action if he made the slightest move. Across from Kato, Yoshiaki frowned. Suddenly, he lengthened his stride, approaching the armoured body. He touched the helmet with the tip of his katana. It rolled back, revealing empty air. Kato hurried to join Yoshiaki. He picked up the armour and a machine slid out – something simple, clockwork powered, its gears rattling noisily as it fell to the ground. There was a soft, wet noise. Only then did he noticed the smell of blood. Kato looked up, past Yoshiaki, to the edge of the clearing. A machine stood there, shaped like a man but made of pistons, gears, and levers. 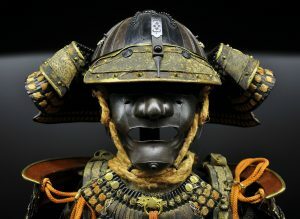 Deprived of his outer layer of armour, the Daimyo of Dust stood exposed, his oiled innards visible for all the world to see. There was blood on his katana. Two of Kato’s comrades lay headless at his feet, another a dozen yards away. The Daimyo opened his hand, scattering loose gears in the grass. Gears that had no place inside his body. His blade gleamed as he raised it. Kato and Yoshiaki braced themselves, standing side by side one last time. At Edo, a dozen samurai had failed to destroy the Daimyo of Dust. Now they were only two. At least it would be a noble end.